Click on the for a closer look Arnold Friberg open and limited edition art prints and canvases of The Prayer at Valley Forge for sale painted by artist Arnold Friberg. Place your order securely online or call us toll-free. Please add $15.00 for shipping, handling, and insurance. The Prayer at Valley Forge by Arnold Friberg is a stunning unframed lithograph perfect for custom gallery framing. It is printed on heavy archival paper and packaged in a large blue folio envelope. This picture of general George Washington (who later became our nation's first President) comes with a certificate of authenticity and a 1.5" x 5" brass plaque inscribed with either a quotation from George Washington's farewell address or a Bible quote from II Chronicles 7:14. "I consider it an indispensable duty to close this last solemn act of my official life by commending the interests of our dearest country to the protection of Almighty God and those who have the superintendence of them into His Holy keeping." "If my people...shall humble themselves, and pray, and seek my face...then shall I hear from heaven, and will forgive their sin, and will heal their land." Please specify George Washington quote or II Chronicles 7:14 Bible verse for the accompanying brass plaque. This unframed open edition paper print comes mint in its original folio and includes a genuine certificate of authenticity from Friberg Fine Art. This unframed open edition paper print comes mint in its original folio, includes a genuine certificate of authenticity from Friberg Fine Art, and is individually signed by the artist Arnold Friberg. This rare limited edition print comes unframed mint in its original folio. It is signed by the artist Arnold Friberg and comes with certificate of authenticity. This extremely rare limited edition artist proof print comes unframed mint in its original folio. It is signed by the artist Arnold Friberg and comes with certificate of authenticity. Please add $20.00 for shipping, handling, and insurance. This rare limited edition canvas comes unframed mint in its original packaging. It is signed by the artist Arnold Friberg and comes with certificate of authenticity. This extremely rare limited edition artist proof canvas comes unframed mint in its original packaging. It is signed by the artist Arnold Friberg and comes with certificate of authenticity. This beautiful print is embedded in a border of the American flag and includes a patriotic caption. It comes framed in an early American walnut frame with 2" frame moulding and gold trim in your choice of the following. "The face of prayer has changed — The need for prayer has not. GOD BLESS AMERICA"
Please add $17.50 for shipping, handling, and insurance. Please add $22.50 for shipping, handling, and insurance. This unframed open edition canvas giclée comes stretched and includes a genuine certificate of authenticity from Friberg Fine Art. Originally painted in 1976 to honor our country's bi-centennial year, The Prayer at Valley Forge in the last 20 years has become increasingly cherished and recognized as a supreme 20th century masterpiece of patriotic American art. In it we feel the cold, the suffering, and the weight of the burden falling on that tall and lonely man, driven to his knees there in the bitter snows of Valley Forge. This picture, marking a bold rejection of fleeting artistic and political "fashions," now expresses a powerful affirmation of faith, patriotic duty, and the deep spiritual depths in the founding of our country. "Since I was a boy, I have revered General Washington. At age 12, I drew what I thought was a fine picture of him astride his white horse. Along with learning the American legend of his praying at Valley Forge, this deep inspiration of boyhood was never to leave me. "And so it was that I waited many years to picture him again, in prayer now, in the snow, dismounted from his strong horse — only this time in the full power and richness of oil colors. "To prepare for this painting, to insure accuracy in trees and landscape, I made a pilgrimage to Valley Forge, in the dead of winter. In the summer, the place is filled with visitors. But now, in the snows of February, it was deserted, the wind moaning through the great trees — silent, lonely, and cold. It was a cold that chilled to the bone, a cold that froze my fingers until I could no longer sketch nor even snap my camera. "To insure accuracy in man-made things, I sought out whatever museums, collections, libraries, or informed individuals could offer on horse gear or uniform. At the Smithsonian Military History Museum, I made minutely accurate sketches from the very uniform actually worn by Washington. "As for facial likeness, I studied every portrait ever sketched, carved, or painted from life, but always keeping in mind how cold and rawboned he must have looked during that winter encampment. "But such research, vital as it is, provides only physical facts. What I really tried for was, through the medium of paint, to recall the pain, the cold of that cruel winter of 1777-78. I sought to pay tribute to the tall and heavy-burdened man who alone held our struggling nation together. "For, while the British grew fat and warm and well-fed in Philadelphia, it was the man Washington who stayed with his starving and freezing army through that dreadful winter at Valley Forge. It was in desperation that he wrote to the governor of New Jersey, 'Our sick naked, our well naked, our unfortunate men in captivity naked?' With his own countrymen indifferent to their condition, where else could he turn but to God? "It should be plain to anyone that this is a symbolic picture, yet the event is not without historical documentation through eye-witness accounts of Valley Forge residents. But from Washington's own words there can be no doubt of his deep and humbled dependence upon whom he chose to call that all-wise and powerful Being on whom alone our success depends. "It is my hope that coming through this picture will once again whisper the spirit of Valley Forge, of suffering and devotion and pain, of liberty, and of the hand of God in the affairs of men." The Prayer at Valley Forge copyright© 1992 by Arnold Friberg is prohibited from being copied. All applicable copyright© laws apply and are reserved by Arnold Friberg. 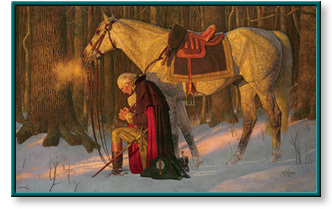 Arnold Friberg art, George Washington, praying, kneeling, artwork, art work, canvases, images, paintings, pictures, and prints of The Prayer at Valley Forge by artist Arnold Friberg for sale. The Prayer at Valley Forge painting by lds artist Arnold Friberg can be purchased in art print or canvas form at special sale prices at Christ-Centered Art.